We couldn’t have wished for a better start to the 2015 holiday season than the NEC Spring Caravan & Camping Show. Last year we brought a restored 1970s Sierra Supreme to the NEC show and launched the brand new Hartfield. This year we did the opposite and revived an old favourite as our new van – The Milano, and showed off the Holiday Home of the Future, The Concept! Just like last year though the reaction to both vans was fantastic! 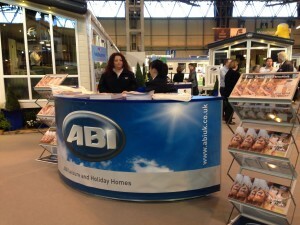 We say it time and time again but it still holds true – meeting ABI owners and prospective buyers, and answering their questions and hearing their thoughts is really what makes these shows for us. So, if you came to the show, THANK YOU! And a special thank you to the parks that joined us on the ABI stand, including Tamar View, Lake Coast and Dale, WDLH, Lloyds, Broughton Leisure, Salop Leisure, Surf Bay, Parkdean, Park Resorts and Away Resorts! It was great to have you there with us and we hope you have a great 2015 season! If you couldn’t make it to the show you can check out The Milano by clicking here. If you were at the show tweet your thoughts with #ABICaravanShow and we’ll retweet our favourites!